Lord Tebbit asks a good question: if the Thatcher years were so bad, why did so many people vote for her again and again? I would say it’s an interesting question. I’m not sure it’s a good one. It’s an example of a crafty old politician (Tebbit, that is, not Nero) performing a bit of misdirection. As the Thatcher years were so bad, why did her party win a majority three elections running? How was it possible that her strong, dreadful government was able to make miserable the lives of so many people for so long? The answer to both lies in the iniquity of Britain’s “First Past the Post” electoral system. Mrs Thatcher led the Conservative Party to victory in three elections: in 1979, 1983 and 1987. They were never supported by more than about 13.8 million voters, out of a voting population that rose from 41 to more than 43 million in the 8 years. In 1979 more than 27 million people did not vote for the Tories, yet the Tories took a 43 seat majority. In 1983 more than 29 million people did not vote for the Tories, yet the Tories took a 144 seat majority. In 1987 more than 29.5 million people did not vote for the Tories, yet the Tories took a 102 seat majority. Of course, in a bit of misdirection of my own, I have totalled the votes against the Tories with the numbers of people who had a vote but chose not to use it. One reason Britain has such a poor rate of participation in national elections must be because so many voters feel there’s no point. With the system as it exists, most votes are wasted. Why take part in the farce? With a system of proportional representation, given 72.7% rate of participation, then 1983 would have seen a the Tories gain 267 seats (instead of 397), Labour would have won 173 seats (instead of 209) and the SDP-Liberal Alliance would have taken 158 seats (instead of 23). If that hadn’t put an end to Mrs Thatcher’s premiership, it would certainly have forced her to moderate her draconian policies. Defenders of the First Past the Post system argue that it makes for strong government. But then so does one-party dictatorship. A democratic system must surely seek to represent the opinions and wishes of as broad a spectrum of its members as it can. The British system assumes that there are two sides to every issue and that two parties can represent these points of view. If that was ever true, it certainly is not any more. By denying a voice in government to a large group of its citizens, the British system brings democracy into disrepute. It also encourages people to try to solve their problems and to get their voice heard by non-democratic means whether through civil disobedience, violent protest or bribery and corruption. The system is rotten. It was rotten when Mrs Thatcher was Prime Minister, it was rotten when Tony Blair was Prime Minister. Will it continue to rot for another century or can we hope for change? 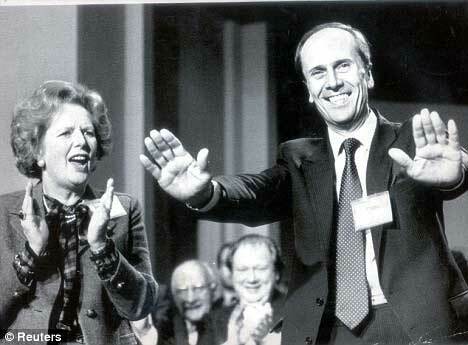 The Reuters copyright image of Norman Tebbit and Mrs Thatcher accepting applause at the Conservative Party Congress in 1985 is reproduced from a Daily Mail article by Norman Tebbit “Battle for Britain”, dated 13th March 2009. Boil your blood, Â read the article.